A blend of tasty Tripe, Free Range Chicken and flavoursome Lamb with vegetables, maize and bran. 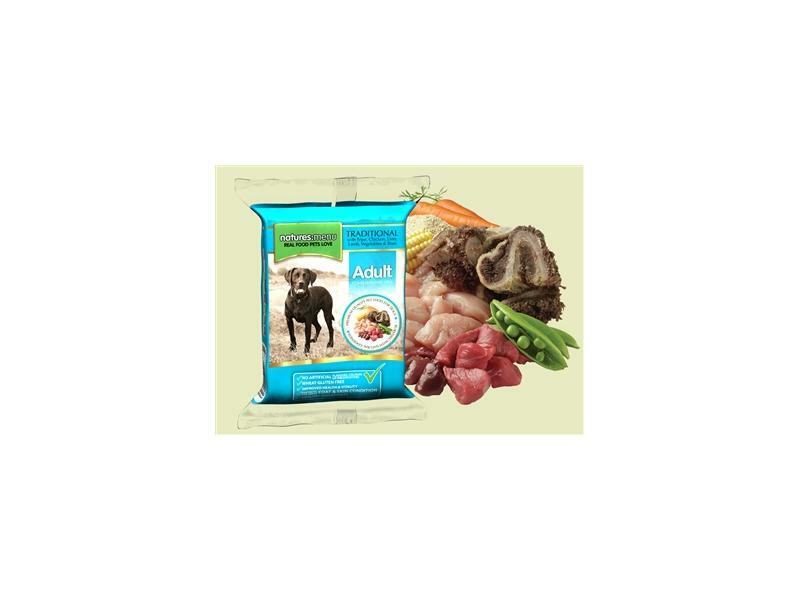 Packed with protein this meal is Ideal for working dogs. Please note that this is a complementary product and not a complete meal. Serve as part of a complete and balanced diet. Natural, healthy, and served in a convenient 300g portion. Simply thaw and serve. Contains raw bone for added nutrition. A complementary food ideal for working dogs. Made with tasty Tripe, Free Range Chicken and flavoursome Lamb. THIS IS NOT A COMPLETE MEAL. Protein (12%), Crude Oils & Fats (9%), Crude Ash (2.1%), Crude Fibres (1.2%), Moisture (66%). Vitamin A 1,500iu, Vitamin D 150iu, Vitamin E 21mg. Trace elements: Zinc oxide 39mg, Iron sulphate monohydrate 30mg, Copper sulphate pentahydrate 11mg, Calcium iodate anhydrous 0.65mg, Se-lenium yeast inactivated 13.2mg/kg. This is a complementary food for working dogs. Serve as part of a complete and balanced diet. We suggest that home-made meals are prepared with 60% Natures Menu meat, minces or chunks, 20% blended fruit/vegetables and 20% easily digestible carbohydrate (cooked brown rice, oats or sweet potato). Fresh water should always be available. We recommend that you refer to our feeding guidelines for total recommended food amounts per day. You will then need to calculate the ratios of meat, carbohydrate and blended fruit and vegetables to achieve the recommended daily amount. Keep frozen until use. Defrost in a sealed container on the side for two hours or in the fridge overnight. Once defrosted please use the product within 24 hours. Normal hygiene rules apply for preparing and handling fresh/raw ingredients. There are currently no questions for Natures Menu Traditional Dinner for Working Dogs - be the first to ask one!